Get ready to see results! Invest just six weeks with us and see what your body’s capable of. Every client that followed through with the Transformation Program saw dramatic results at the end of the six-week program. It’s 50 minutes per day. Five days a week. Think you can you handle it? If any of those answers are yes, get ready for a Mind and Body Transformation.Do you want to safely see dramatic results in six weeks? Are you looking for a true health and fitness lifestyle change? Do you want to gain self-confidence and feel strong again? This is the perfect program for people who want to see quick results. It motivates you to see how much your body can change and it’ll get you ready for that upcoming wedding, reunion, special event or just to feel healthy! Since 2002 clients have reported dramatic loss of inches, improved eating habits and improved self-confidence after completing the Transformation Program. More importantly, clients have learned to keep the weight off through healthy lifestyle changes. I lost 10 lbs in the first six weeks on Shari’s intensive program. Now 20 lbs lighter, I am proud to thank and give credit to Shari for giving me the tools, guidance and motivation to succeed. Shari reshaped my body, but more importantly, Shari taught me about portion control, moderation, and how to get the best results in the least amount of time. After six weeks working out with Shari at Defineit, I can see the change in my body and I have never felt better. 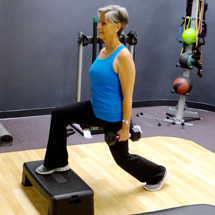 Shari’s workouts are strategic and efficient – I love that when I leave, I know she has maximized my time with her. As a trainer, Shari is knowledgeable, motivating, and supportive. Shari has been conducting these sessions for over ten years, and her clients have all been successful in reaching their goals!! Call or email to schedule a free consultation to find out if the Transformation Program is right for you. The cost of the program is a six-week package (30 Sessions).